Article publié le Monday 21 May 2012. Basingstoke, April 24, 2012 - In a joint effort to improve the entertainment experience of hearing or visually impaired audience members, Regal Entertainment Group has chosen Sony’s Entertainment Access Glasses with audio, for practically all of its fully digitised theatre locations across the US. The glasses provide an unsurpassed theatre experience and more flexible options for deaf, hard of hearing, blind or visually impaired theatre patrons. The Sony technology consists of specially designed eyewear, and a receiver, allowing deaf and hard of hearing customers to view closed captioned text in their direct line of sight, for both 2D and 3D movies. For blind and visually impaired customers, Sony’s Entertainment Access Glasses, paired with headphones, provide descriptive audio tracks. The technology began being deployed in April of 2012 and is expected to be completed by first quarter 2013. 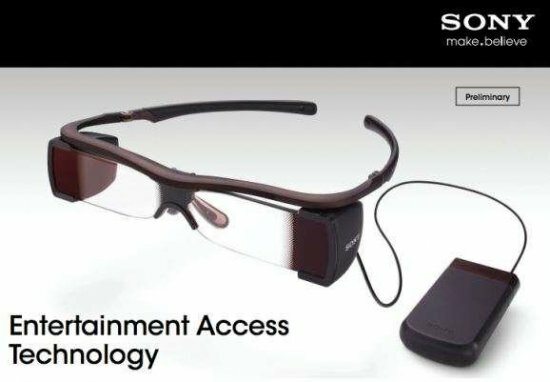 Sony’s Entertainment Access Glasses with audio is a ground-breaking means of addressing the growing needs of the deaf, hard of hearing, blind and visually impaired audiences. Sony’s Entertainment Access Glasses with audio, allows those audiences to enjoy the theatre experience in a relaxed, natural way without the inconvenience of separate screening times or special seating. The new technology is designed to offer customers superb comfort, ease-of-use and direct line-of-sight captioned text, verses other technologies that require patrons to shift their focus between the auditorium screen and a separate display unit. The key ingredient in Sony’s Entertainment Access Glasses consists of light-weight glasses that are very similar in size to many 3D glasses in use today. Weighing less than three ounces (84 grams), the glasses can be programmed to display bright closed caption text in a choice of six languages. The location of the text can be easily adjusted, allowing moviegoers to follow without having to avert their gaze from the screen, or worry about a closed caption device obstructing the screen. A clip-on filter enables 3D viewing, while avoiding any blurriness that can occur in other solutions.